Addis Ababa will never harm the Egyptian people and their interests, Ethiopia's Foreign Minister Workneh Gebeyehu said Wednesday during a joint press conference with his Egyptian counterpart Sameh Shoukry in Cairo. Ahead of the press conference after his arrival in Egypt, Gebeyehu met with Egypt's President Abdel-Fattah El-Sisi who stressed that Egypt does not interfere in other countries' domestic affairs and does not conspire against them. At the press conference, Gebeyehu said he came to deliver a message to Egyptians that his country was not seeking to cause suffering to the Egyptian people, in reference to Ethiopia's construction of the Grand Renaissance Dam on the Nile river. "We will not harm the Egyptian people, but they should also help us in making use of our natural resources," he said. Gebeyehu described both nations as connected "throughout history and the Nile River," addressing Shoukry as his "brother." "I am here today to assure the Egyptian people that we must work together to accomplish our goals," he said. 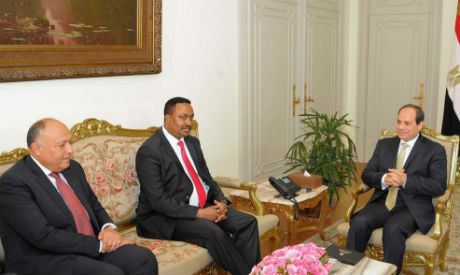 The Ethiopian minister said that he discussed bilateral relations with the Egyptian president and foreign minister "honestly." "We have to work very closely in the future with consultations on all issues," he said, adding that El-Sisi described the relationship as an important one that should be improved. Shoukry said that the discussions were characterised by a "keenness [to boost] the relationship, with further dialogue on the necessity of maintaining it." The Egyptian foreign minister added that the "transparent and honest" discussions were intended to promote the best interests of both nations. According to Shoukry, the two countries' officials will be meeting and holding talks every two months to work on improving relations. He added that El-Sisi expressed hopes for Cairo to host a joint high committee meeting soon, with Ethiopian Prime Minister Hailemariam Desalegn in attendance. The first-ever visit by FM Gebeyehu to Cairo comes amid reports of renewed tensions between Cairo and Addis Ababa over the past months, with back-and-forth accusations of interference in one another's domestic affairs and conspiracies against each other involving other foreign countries lodged from both sides. Cairo has said it fears the construction of the Renaissance Dam, which has not been completed yet, will negatively affect Egypt's Nile water share. However, Addis Ababa maintains that the dam project, which Ethiopia says it needs to generate electricity, will not harm downstream countries. In September 2016, Egypt, Ethiopia and Sudan signed final contracts to implement long-awaited technical studies on the potential impact of the dam on downstream countries.